Maransin's Division deploys: My boys get an outing. Perry and Victrix from my own collection get a day out at "Wembley"
2 x 12pdr foot btty. All btns are 36 man except where stated. The French can deploy anywhere South and east of the river Zadorra. 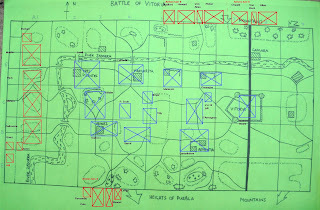 The Spainish Guard and the Reserve artillery must deploy in the environs of Vittoria. So, thats it for the French....not great. The Brits have more skirmishers, plenty of which are rifle armed. The French have a bit more heavy cavalry. The French have some 50' to defend and the Brits can pick their spots to attack. The only inteligence the French possessed was that the British were attacking from the west, and that they could expect strong flank attacks from the south and north. Faced with this, frankly, I was at a bt of a loss. Defend too strongly tothe west and risk the army being cut-off, defend the flanks and give the british a free ride over the river and still get taken in the flanks. In the end I went for a rather predictable defence. A crust everywhere, with a central reserve as a reaction force. One area where I thought I might do some good was in the North western corner where I thought I might be able to flatten out the line and remove an "apex" at Tres Puentes" subsequently I placed a strong division there (Laval) in the hope of mounting some sort of counter-attack. This sort of worked. The other major problem was the village of Arinez. I felt I had 3 choices here. 2:Mount a "picket defence" of a few btns plus cavalry slung out to impede the british advance. 3: Use a "minefield" tactic and not actually defend the village but mass troops behind it utilising it as an obstacle and making it untenable for the British to occupy. In the end I chose the second when the the "minefield" was probably the sensible option. Part 3 will reveal the outcome! So, the scene was set for Gerry and I to slug it out for a couple of days. The choice of game was influenced somewhat by the fact that there is a weekend game coming up doing Vittoria, so it meant Gerry didn't have to change the terrain around again. We completed this task on Sunday afternoon, only took about an hour, and laid out the buildings etc. One unusual feature of this game is that the roads are packed with French baggage. We laid out about 40 models of limbers, wagons, caissons etc. all over the roads. In the game these had a real effect. They all headed towards the exit road in the north-eastern corner of the map, moving at just 2 x D6 per turn. They had priority over everything else on roads, could not be overtaken, and unformed anything they passed through. They blocked all fire and LOS. If they were charged or came under small arms fire they were abandoned, the model remaining on table as an obstacle. If a British unit came within charge range it had to attempt to charge. When it contacted it then had to loot the baggage for 2 turns before rallying. Then the baggage model would be removed from play. CiC Wellington. adds +1 to morale of all infantry and artillery within 18"
So, thats the British army. Impressive to say the least. 2 may enter to the northern edge, and 1 to the south. Each may consist of a maximum of 2 & 1/2 infantry divisions (Pack, Longa, Bradford, Morillo each count as 1/2) and 1 cavalry brigade. Forces entering on the Northern edge enter on the turn corresponding to the board number (ie. turn 1 to 9 ) depending how far east they wish to march. Forces on the southern edge are the same up to board 6 except each march must dice for arrival. Ignore Spanish routs. Regardless of how many spanish rout within 12" British infantry and artillery only ever count a minus 1 for friends retreating. Roll 2d6 for rallying after melee. Ignore woods and rough terrain. Recieve 1/2 casualties to skirmish fire. When charged and passing morale they may evade (12") without unforming any friendly units in their path.